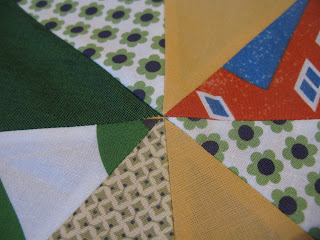 I am linking up for the Blogger's Quilt Festival at Amy's Creative Side. I love this virtual display of quilts, there's so much talent. If you're visiting from the festival, welcome and thanks for taking the time to read my blog and quilt story! My entry is Spinning Stars, a baby quilt I made for a friend using Anna Maria Horner's pattern. I was slightly nervous of the template pieces but was lucky enough to have a friend make me some acrylic templates, which made the process easier, although I still spent a long time cutting. The fabric was a bundle my friend had bought long before she was pregnant but had never used, it was clearly meant to be. She gave it to me and I chose the backing and binding fabric to coordinate. I kept that a secret and she didn't know what pattern I was using either so the quilt was still somewhat of a surprise! This is the first (and so far only) quilt I've completely hand quilted and I loved every second of doing it. I used Anchor Pearl Cotton, which really helped highlight the shapes of the pattern. It now happily lives with the loveliest family and has been rolled around on by the most adorable baby boy. Finished quilt measures : 36" x 54"
It's a wonderful quilt - lovely to see it again! That handstitching makes it very special. Well done for giving it up then Lucy! Great work and a good home by the sounds of it! Hope you are managing a few minutes of rest! It is a great quilt Lucy! One made with love is the best type! I envy your hand-quilting prowess! It's great Lucy. I adore the hand stitching. Lucky friend! It's beautiful, Lucy! Lovely quilt! The hand quilting is fabulous! Lucy, this is one wild and wonderful quilt. What a perfect gift for a little boy. Beautiful quilt Lucy - love all of your hand quilting ! Love this quilt! Great entry Lucy! It is beautiful Lucy! The handquilting is perfect you did such a great job! I can see why you would want to keep it! It is a real beauty Lucy :) Personally love all the green. Very nice! Love your hand quilting - extra special! Wow your handstitching is amazing. You know I love this quilt - it's a great entry Lucy. Lucy! This quilt is fantastic! I love that the colors of the spinning stars look like kaleidoscopes! Your hand quilting looks perfect! Beautiful quilt! Would you mind sharing who made your acrylic templates? I'd love to make this, but the cutting looks pretty intense! I am so glad I stopped by to see this. You did such a lovely job! The yellows and greens are so fun together and I really love the hand quilting details you added. :) Cute little puppies too! Great choice for the entry, Lucy! It's beautiful and I love that you've hand quilted it. Best of Luck!